Over recent years, the number of surviving pearling luggers is dwindling as one by one time catches up with them or they are destroyed by cyclones or by other circumstances. Amongst the luggers lost was the Viking in 2007. The following describes the current situation of a 106 year old lugger Grafton that could really use some help. If you ever wanted your own authentic pearling lugger, have a mate that wants one (remember Father's day this weekend) or you know of a museum that is seeking a pearling lugger to add to their collection, then now would probably be a good time to contact the owner. Another option would be if you have available an alternative site that the owner could use to safely keep the Grafton. We have arrived in Port Douglas on the journey north and was rather saddened to see that 'Grafton' has been left ...on a mud bank in the river at Port Douglas. Inquires at the Marine Office revealed that the slipway had been acquired by the marina owners and I gather that there were fees payable or she was just in the way, so they towed her over to the mud bank and [left] her there. Does anyone know her owners and why it has come to this sad state of affairs?? I have attached some pictures of her that were taken today. [See below]. Firstly Grafton... Steve S..... is still the owner and he lives right across from the slipway. He, not the Marina, took Grafton to the other side. She was in the Slipway hold (owned by the Marina) and they no longer wanted her there and I believe Steve thought that was his only option. He still has the engine, all rigging, masts and deck stored away. Her hull is in need of major repairs... the oregon planking is leaking even with layers of "plastic" ply screwed to the outside. She has been "for sale" for some time. The croc comes for free! This is terribly sad, GRAFTON was such a beautiful lugger. I fear that the Port Douglas harbourmaster won't tolerate her for long in that condition. History and details: Carvel oregon planked on teatree & penda frame. 50' Loa. 47' Lwl. 7' 2" draft. 24t displ. Cost £450. 1907/11/12 registered, Townsville No.6 of 1907. Pearling at Torres Strait, manned by Japanese crew who dived for mother-of-pearl shell. 1913/05/12 registered, Sydney No.25 of 1913. Wyben Pearling was a subsidiary of Burns, Philp. 1914-15 part of Thursday Island pearling fleet. 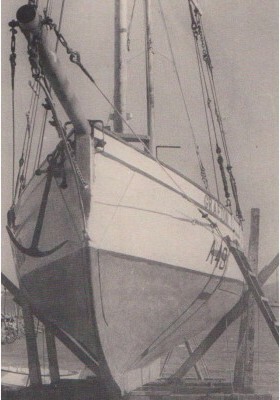 Requisitioned & operated by Australian Army by 1944/09, lugger, sail only. 1944/09 operating with Australian New Guinea Administration Unit (ANGAU). 1945/06/09 register closed upon sale to Commonwealth Govt. WW2 taken over by Australian Army. 1946/04/11 reported lying at Samarai. 1946/09/02 sold for ₤700, 'as is-where is' at Samarai. 1950/07/18 participated in annual pearling lugger race at Thursday Island over course of approximately 30 miles, all required to be anchored at commencement of the race, at sound of signal to start there were the sounds of screeches and groans of the many windlasses. Fitted with auxiliary motor by 1956, 30bhp 1Cy. 4SA Southern Cross Machinery Co Ltd diesel. 1956/08/16 registered, Sydney No.19 of 1956, 15.43g 46.6' x13.1' x5.4' depth of hold, 7.2' depth from top of deck at side amidship to bottom of keel, length of engine room 10.2', two non-WT bulkheads. 1958-67 pearling at Thursday Island. 1963/05 fitted with new motor, 1Cy. 4SA Gardner Barton Hall diesel, surveyed at Thursday Island. 1985 based at Cairns, used for fishing &charter work. Restored with cabin over old hatches by 1985. 1986/11/07 register closed. Refitted for use as a private yacht by 2001. c2001 sold 23K. 2002 based at Port Douglas, Qld. Sank nd, raised & sold in derelict state, refitted by new owners. Fitted with wheelhouse aft by 2005. 2005 Goodall president of Cairns CYC & Cairns Wooden Boat Association. 2005/03 moored at piles in Trinity Inlet, Cairns. 2006/c09 on hardstand at Cairns without masts, 6 planks found to require replacement due to worm damage, added superstructure to be removed. 2007/01 sighted moored at Trinity Inlet, Cairns with deckhouse still in place. 2009 under restoration for training. 2010/02/21 reported still at Port Douglas. 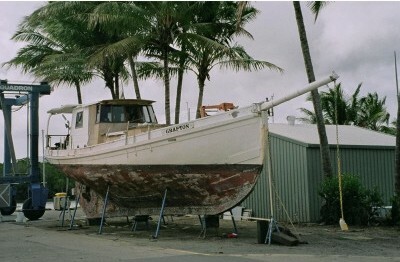 2013/08 reported removed from slipway and lying on mud bank at Port Douglas without engine, hull in need of major repair. 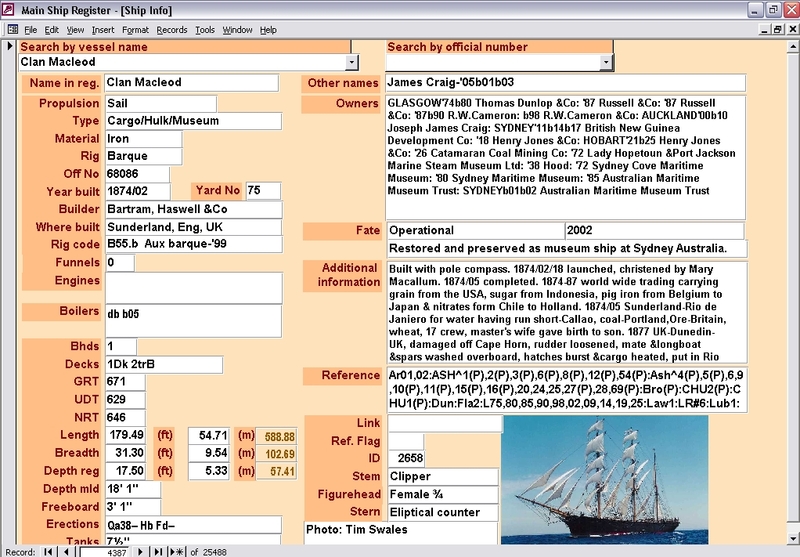 If information is published please acknowledge Mori Flapan: Register of Australian and New Zealand Ships and Boats 2013 and any other major contributors listed in References above (usually denoted by capitals).